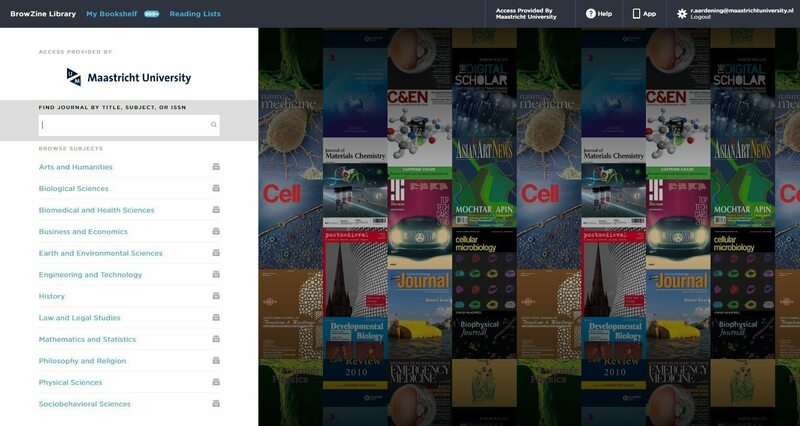 BrowZine makes it easy to keep up to date with the key journals in your field. Read on the sofa or at your desk! At Maastricht University Library we use BrowZine to provide online access to all our journals. Our popular e-journal browsing service is available as part of the Online Library, as an app on your mobile device. and as BrowZine Web (see image below) on your desktop or laptop with new functionality – bookmark and re-use links to our journal lists. Easily find, read and keep track of the latest articles published each week or month. EndNote appears as a Bibliographic Management export option from the PDF view in BrowZine. With a single tap, users may export citation and PDF data directly from BrowZine to their EndNote libraries. Choose “Open in..” to open PDFs in another PDF reader on your tablet to annotate. To create your personal journal library in BrowZine and to make your personal library portable (use it on all your devices), you need to set up a BrowZine account (once). BrowZine will prompt you when setting up a connection. Better not use your UM or MUMC+ credentials, as this account information will be stored at BrowZine. Presented journals and full-text articles are provided by Maastricht University. To access the subscribed journals and/or to download the full text of selected articles, you need to establish a connection to the Maastricht University network with your personal UM or MUMC+ account. The information about your connection is stored on your device. So you need to establish a connection (once) on every device you use. You only need the BrowZine app on your iPad, iPhone, Android smartphone or tablet to read almost all the Library’s e-journals from 2005 onwards. Currently, BrowZine is available on iPad, iPhone, Android smartphones and some Android tablets. Download and start using BrowZine by clicking on the appropriate link above from your device. Open BrowZine and Go to “Choose Library”, search for Maastricht University. If you are a UM employee or student, choose Maastricht University and login with your UM account. If you work at MUMC+, choose this organisation and login with your MUMC+ account (your credentials will only be stored on your personal device). Go to “Titles A-Z” to search for a specific title by name or keyword, OR “Subjects” and select a subject area. Start browsing! If you don’t find your journal under Subjects, tap “Titles A-Z” and type a Title keyword in the search box. For questions or information, use the web form to contact a subject specialist.